We definitely love our Diaper Genie Elite Diaper Disposal System. Between prolific little baby poop and really stinky toddler diapers, it had gotten scary when you open it. To paint a picture, it had gotten to the point where diaper changes were dreaded. I would get the child safely out of the area, hold my breath and open the diaper disposal system with the still amazing and handy foot pedal. Then I would quickly throw the diaper in and evacuate the area for at least 5 minutes. If it had been more than a day since the bag was last changed this would also involve having windows open. Not a single window… but windows. Plural. We really just put up with it because I thought that there was only so much a disposal system could do. Putting each individual diaper in the garbage outside wasn’t an option either because really… who has time for that? Step in the Diaper Genie Carbon Filters and disposing our diapers are no longer a hazardous mission. The Diaper Genie Carbon Filters are made with activated carbon that is safe and natural which works to lock in odour molecules rather than just tryng to mask odour with fragrance. Just attach the cartridge to the lid of your Diaper Genie and breathe easier. It should be able to handle even the strongest diaper odours and the filters should last up to 90 days each! Each Diaper Genie Carbon Filter comes with one carbon filter case and four carbon filters. Don’t just limit the Carbon Filter to your Diaper Genie either. These work great throughout the nursery or anywhere else in your home that has odour issues. Stinky gym bag? Not a problem! You can feel comfortable knowing that the odours around your home and in your diaper disposal system are being continually soaked up naturally by the activated carbon rather than just being covered by harmful chemicals. Simple and clean smelling, this is a wonderful solution to odour problems in the nursery and beyond! 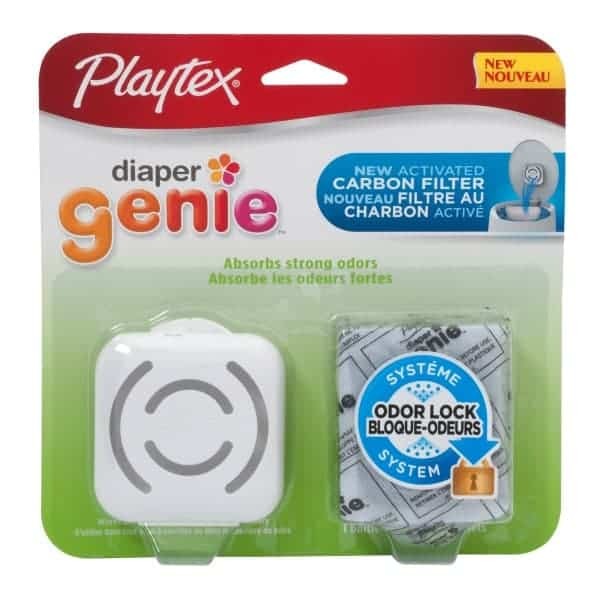 The Playtex Diaper Genie Carbon Filter is available in the Diaper Genie Elite pail and is also sold separately at major retailers across Canada. It has an SRP of $5.99 for a 4-pack. In addition, the Diaper Genie Elite and Diaper Genie Essentials diaper pails have an SRP of $35.99 and $45.99, respectively. Wish we had these when we still used diaper geenies! I would really love to have this, there are areas that are very bad smelling. There’s one area in particular I have to hold my breath or I bring a fan and blow the odor the other way. Thank you for sharing this review. A diaper changes – always a dreaded time! Love that there are products like this to help contain the smells! I love this!! This is a great idea for the garbage too! Thanks for the info!! I don’t think you need a diaper Genie to use these. I would use these on my garbage pail. This sounds like a great product and I wish it had existed years ago. Garbage pails and diapers bins can really stink. I am so glad that they have come out with these. It’s about time!